TheGenealogist releases York Colour Tithe Maps and Yorkshire Directories. For example, if we wanted to find the plot where one William Gibb lived in the parish of St Cuthbert during 1845 we can do this by selecting Tithe & Landowner on TheGenealogist and then enter his name into the Master Search. In William’s case he was the occupier while his landlady was Ann Wilson and we can see from the description in the Apportionment book that he rented a house and gardens from her. The value is small and the Rector is only entitled to 6d tithe rent from the plot. This is in contrast to another example that we can find in the York tithes. 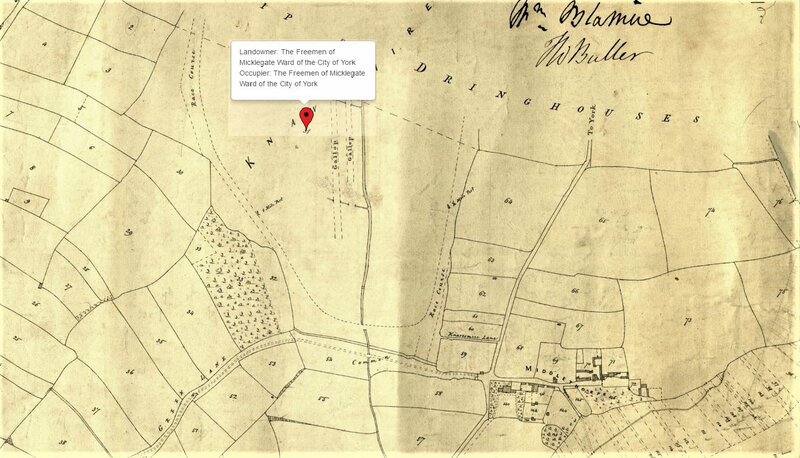 We are able to see an image of the apportionment book and this reveals in the description that the land is ‘Part of Knavesmire a stinted pasture’. A 'stint' or 'gait' being a pasture that is limited to a certain number of animals. A person who has the right to graze their sheep or cattle on the stinted pasture may allow a fixed number of their livestock to feed there. Each grazier holds a certain number of stints and a formula will be in force that calculates the different value of each type of livestock. So one stint could equal one ewe with her lamb, while four stints may equal one horse. Anyone visiting the racecourse, whether it is for the family history show or to watch the races, can’t help but notice the old Terry’s Chocolate Factory next door. This art deco style facility, which no longer manufactures chocolate, was built in 1926. The company has, however, a long and rich history connected to York and by searching within one of the twenty three Yorkshire Trade, Residential and Telephone directories that have also been released by TheGenealogist this month, we can find the listing for the company. If an ancestor had a business then the commerical listings in the directory can help us find where they may have worked. In the 1897 Kelly’s York Directory we can find Joseph Terry & Sons Limited, manufacturing confectioners and see that at that time they had factories at Clementhorpe and at St Helen’s Square in York. The later address being where the family business had started and Clementhorpe was the factory on the River Ouse that allowed them to better distribute their products and import the raw materials - this move allowed Terry’s to really take off as a confectioner. We can, likewise, find the competing company of H.J. Rowntree & Co. within the same directory. It shows us that Rowntree’s had their business premises at Haxley Road and Tanner’s Moat. Directories can also be useful to find the addresses of residents, the railways that served the area and read about communications links to other towns. These may be of help to the family historian who has ‘lost’ an ancestor as they could suggest where a person may have travelled and can be a great compliment to a census record. In the case of a head of the household we may be able to find an address different from that recorded in the decennial census. 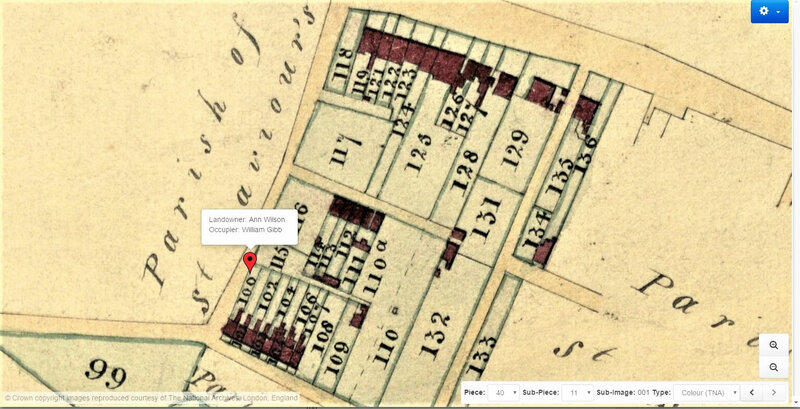 This may help fill in the gaps of where a stray ancestor moved to between the census. It can also add to our understanding of the place where our ancestors lived. Sir Joseph Terry had been the Lord Mayor of York and in the year of this directory, 1897, he is still listed as an alderman and a magistrate. Similarly, John Stephenson Rowntree had been a past Lord Mayor and he too was an alderman and magistrate in this year. 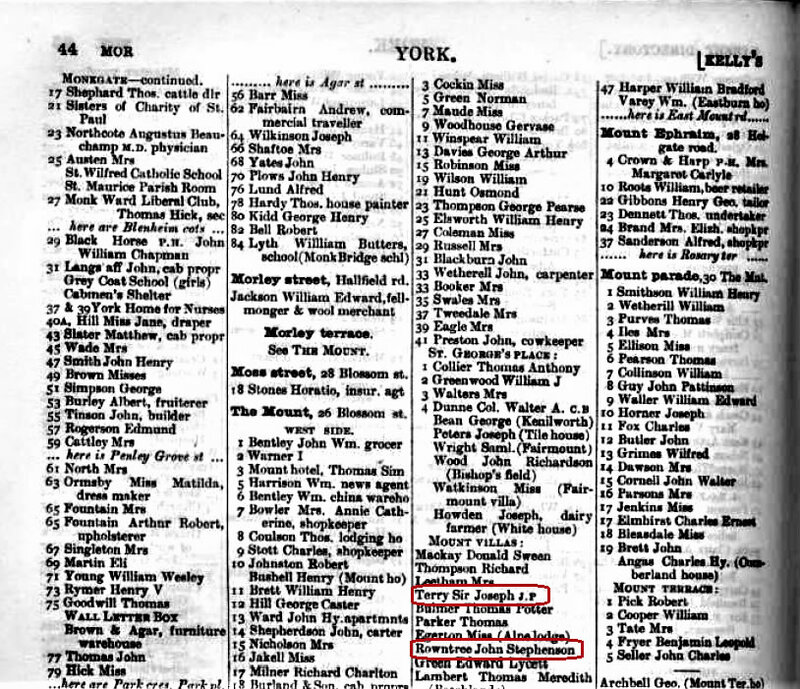 The 1897 Kelly’s York Directory reveals that they both lived at Mount Villas on The Mount; from this we can work out that they were close neighbours in York. The racecourse is also listed in this publication as having an address of Knavesmire, The Mount and so in the same area of the city. It is very sad news to have come out of Immediate Media in the past day. They have announced that the annual Who Do You Think You Are? Live show will not return. This was one of the largest family history event that attracted thousands of family historians to browse the stands and attend the various talks each year. After ten years, first at Olympia in London and then at the NEC in Birmingham for the last three of those years, the event that took place at the beginning of April this year was the last ever! The organisers say it was due to financial reasons that they are bowing out and so we must assume that the show, while popular with family historians of all abilities, just couldn't make them money. I am sure that we shall all miss the event, but perhaps it was just too large a venue. While it is sad that it has gone there are always other more manageable family history shows to visit, including those up an coming in Yorkshire and the London area being organised by Discover Your Ancestors Magazine and sponsored by TheGenealogist. There will be FREE talks from a number of experts, to discover more see the talks page on their website: http://yorkshirefamilyhistoryfair.com/free-talks.php Do you really know who you are? Come and find out – you may be surprised! To celebrate the Fair's 21st year, they are giving away a Discover Your Ancestors Volume 4 and compendium worth nearly £18 when you buy tickets online before the 26th of June! This forthcoming weekend, Saturday 28th June, sees one of the major family history shows in the North of England, the Yorkshire Family History Fair. It is one of the largest family history shows in the UK , now in its 19th year and there are over 70 exhibitors expected on three floors. There is plenty of parking, refreshments are available all day and lifts to take visitors to all three floors. The fair is open from 10am to 4.30pm and features a number of free talks including Mark Bayley from TheGenealogist. If you've not been before, the fair is at The Knavesmire Exhibition Centre, The Racecourse, York YO23 1EX. Admission is £4.50 for adults and children under 14 have free admission. There's more information available on the Yorkshire Family History Fair website. It promises to be a great fair. Hopefully see you there!